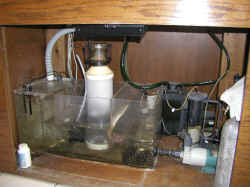 A EuroReef Sump set-up at All Seas Marine, wholesaler in L.A.
Live Rock to Sump Addition Bob and crew. No question this time surprise! I did however want to let you know the outcome of some of your sage advice. Briefly I have a 250 gallon fish only show tank (48" tall and a cylinder) that was fitted with decorative insert like you see in some of the commercial aquarium displays. Spectacular but, form over function since it allowed for limited addition of live rock. <And no ease of access for working on it... or catching livestock, yikes!> I was doing 50% water changes monthly to maintain 40-80 ppm nitrate. I was blessed with a fairly large sump (wet/dry with bio balls) and inquired about adding live rock and lighting. You thought that would help. I was a little nervous since there are some rare fish in the tank. I was able to get some 125 lbs or so of well cured live rock in the sump and eliminated the bio balls. For another reason (copper treatment for velvet which is now gone I hope and another story) I have not done water changes for 4 months. The Nitrate level only moved slightly above 80 ppm the entire time. I am not recommending going this long since water changes do other things but I am happy to report the addition of live rock with lighting to the sump has indeed reduced my nitrate accumulation by a significant amount. Per your advice also I have now turned off the fluidized bed and if ammonia levels do not spike this should reduce Nitrate levels even more. <Should be fine> Thanks a ton. Well worth the effort.